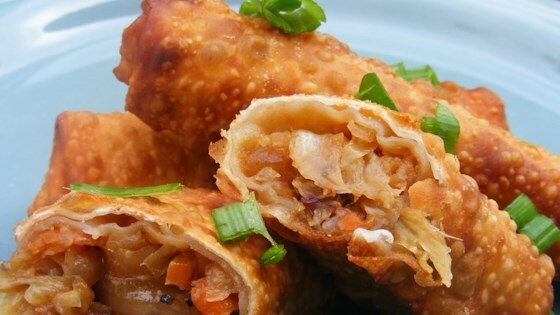 "These are the best-tasting egg rolls you'll ever have. They're even better than the ones served at Asian restaurants. My family just loves them. What's even better is that you can use a variety of different meats--ground beef, pork steak, seasoned ground pork sausage, precooked shrimp--or prepare them without meat for the vegetarians." Heat 2 tablespoons vegetable oil in large wok over medium-high heat. Stir-fry pork for 3 minutes. Transfer pork to paper towel-lined plate and set aside. In a large bowl, mix the cabbage, carrot, green bell pepper, onion, garlic and ginger. In a small bowl, mix the cornstarch, soy sauce, and molasses until smooth. Heat 2 tablespoons oil in wok. Stir in cabbage mixture in batches, cooking each batch 3 to 4 minutes, just until tender. Return vegetables to bowl, and mix in pork. Stir in the cornstarch mixture. Prepare a work surface for rolling the egg rolls. Lay several egg roll wrappers in a row. Place the water in a small bowl; you'll use this for sealing. Place about 2 to 3 tablespoons filling on each egg roll wrapper. Dip a finger in the water and run it along the edge of the wrapper. Fold one corner of wrapper over filling. Fold wrapper sides over filling. Roll wrappers to form egg rolls (See Cook's Note). Heat 1 quart oil in a deep fryer to 365 degrees F (185 degrees C). Fry egg rolls in batches in the hot oil until golden brown. Drain on paper towels and serve with sweet and sour sauce. Instead of pork, you may use 1 pound ground beef or pork sausage, or 8 ounces precooked shrimp. I like to use unsulphured molasses, such as Grandma's®. Follow the instructions on the back of the egg roll wrapper package for Step 5. These were excellent. I put about a half an inch of oil in a frying pan and just kept turning them since I did not have deep fryer. they turned out really well. Thanks! Bake them at 400 degrees for 7-10 min. Spray pan then add egg rolls and spray them too before baking.